Solid cast iron balls were shot at anything. These did not explode. The technology for such wasn't there - yet. Nevertheless, even against massed infantry, these balls could be devastating. Fired to angle horizontally through a formation, a single ball could chop a bloody swath*; it could even be made to skip along the ground through a group like a flat stone across water, amputating and disemboweling as it skipped. Of somewhat smaller diameter than the cannonball, such shot was usually round balls placed inside a canister, which was often metal but in a pinch could have been something else like leather. The projectiles could be pre-made specifically for this purpose and were usually larger than musket balls. 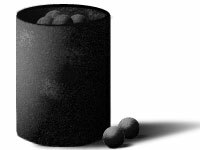 Should the balls be packed inside a cloth bag instead of a can, the collection was dubbed "grape shot," for it resembled a bunch of grapes. An alternate to small-diameter metal balls for canister shot was whatever came conveniently to hand, such as scrap metal, nails, links of chain, etc. The canister acted as a sleeve to carry this aggregate along inside the barrel during firing. ** Due to the lack of any aerodynamics whatsoever to these sorts of projectiles, likely their range was not as far reaching as that of ball. When a breach was made in the defenses of Siena in 1555, the defending commander, Blaise de Monluc, had four or five heavy cannon, he wrote, "each loaded with great chains, nails and pieces of iron," fire at attackers stepping into that breach. Suggestive of the time when stone shot was still made for cannon, small stones, like flint fragments, were sometimes used in place of metal for canister shot. This projectile was recovered from the wreck of the Mary Rose (which sank in 1545) with the flint chips within a wooden cylinder, which presumably would break apart when exiting the barrel. The warship had several small-bore swivel guns on her top deck. Hail shot was most often musket balls in a small cloth bag, the opening tied off. The bags were fist-sized or smaller and fired from small-caliber cannon like a falconet. Into any group of attackers, the shot would rip like hail, as its namesake would on a sprouting garden. **Some motion pictures that show cannons being loaded have had the crews shove the scrap metal directly into the barrel, without benefit of can. Based on my personal experience with small-caliber firearms, I would think that repeated discharges of scrap only from a cannon would cause premature wear, even scoring, on the inside of the barrel. Worn and scored barrels would corrupt aim and lessen muzzle velocity of cannon balls. Cannon were expensive to make. What cannoneer would wish to damage his valuable weapon? One television production, "By the Sword Divided," did show nails poured into a canister as it should have been done.